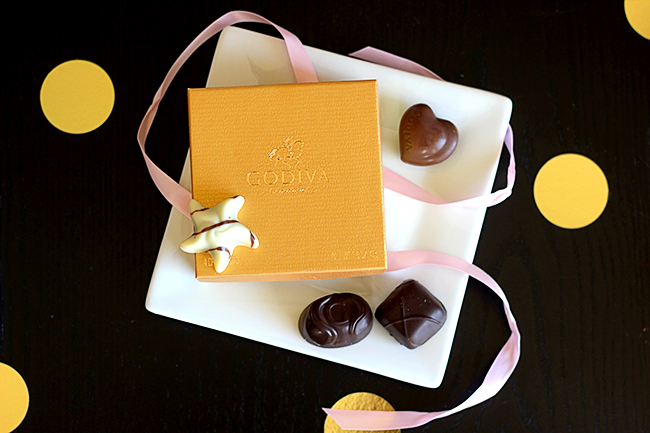 This post is in partnership with GODIVA . Thank you for supporting the brands that help make Bubby and Bean possible. Over the past few years, so many of my friends have had babes (myself included! ), which means I have both attended and hosted my fair share of baby showers. And while each shower has been lovely in its own way in terms of theme and/or design, I've found myself most drawn to those that have chic, elegant motifs with unique, non-traditional color schemes. 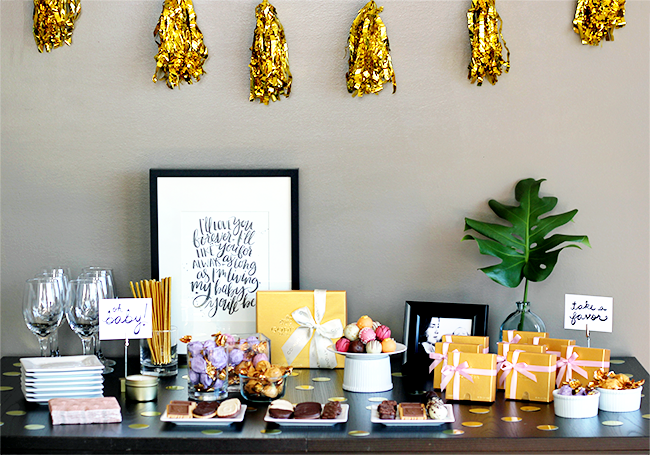 As my regular readers know, I have a thing for tablescapes, so I decided to put one together for a stylish baby shower featuring some of my absolute favorite elements - pops of gold, pretty lettering, black and white, and a variety of GODIVA chocolates to serve, give as favors, and present as a gift to the mom or dad to be. Having a baby is such an incredible life milestone, and designing a beautiful table for a friend's baby shower can be one way to create a lasting memory of this special time for her/him to cherish throughout the years. It's amazing how a little metallic (especially gold tones) can make even a simple table setting feel fancy and festive, and I love how it can so easily break the mold of traditional shower color schemes. For this particular baby shower table design, I knew I'd be using a black table, so I wanted to contrast that with white dishes and displays, along with elements of shimmering gold. I knew I'd be giving away GODIVA 4 pc. 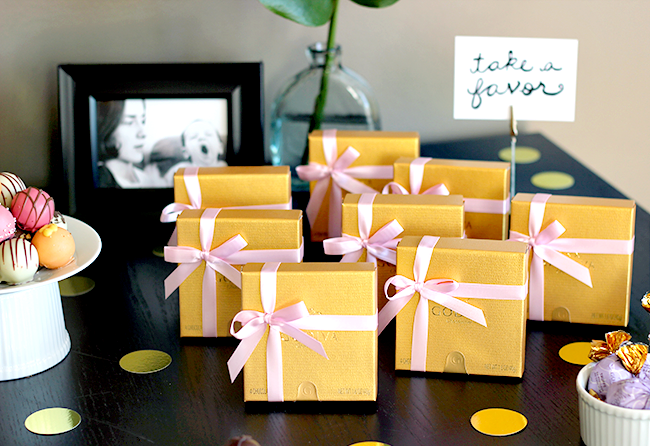 Gold Favor Boxes to guests and a 19 pc. Gold Congratulations Gift Box to the mom to be (more on both of those in a minute), so I already had some gorgeous gold pieces to work with. 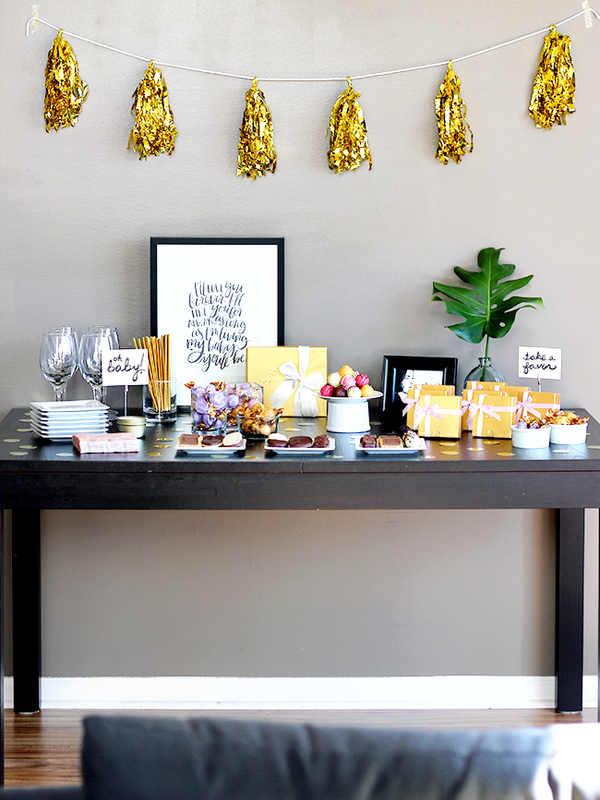 To play on this, I also created a gold tassel banner to hang above the table and some gold confetti circles to scatter on the tabletop, and bought some pretty gold straws/stir sticks to use for drinks. Next I added some pieces to exemplify the baby theme. 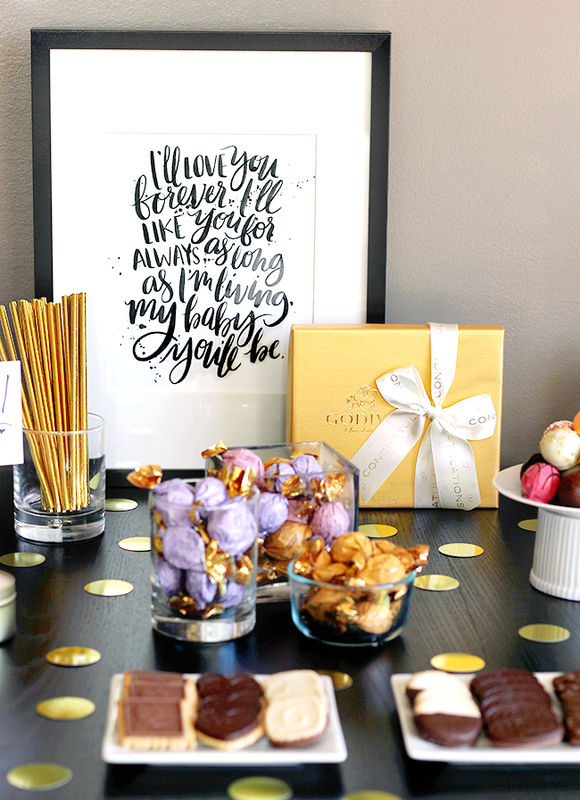 I displayed one of my favorite hand lettered prints that reads "I'll love you forever, I'll like you for always, as long as I'm living my baby you'll be," added a personal mama/baby photograph, and made a tiny "oh baby" sign (along with a sign instructing guests to each take one of the beautiful GODIVA favor boxes). Rather than traditional baby shower decor (baby booties, storks, etc. ), I opted for chicer, elegant pieces that still illustrated the theme of the party. And finally, I utilized various GODIVA products that ultimately both styled the table and provided snacks and gifts for guests. I absolutely love how GODIVA offers so many ways to personalize their gift items so you're able to get exactly what you want, and the 4 pc. Gold Favor Box with Pink Ribbons (which include Dark Chocolate Ganache Bliss, Milk Chocolate Praliné Heart, Dark Chocolate Caramel Embrace, and White Chocolate Raspberry Star - yum) were the perfect pieces for what I envisioned for this event. (And really, can you think of a better favor to bring home from a shower than a gorgeously hand wrapped box of Belgian chocolates?) 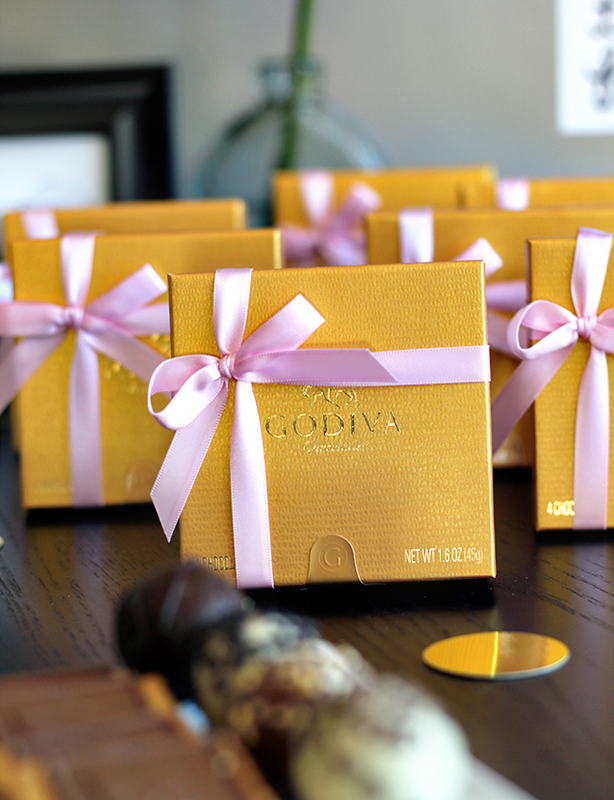 Building on the personalized GODIVA gift idea, I chose the 19 pc. Gold Gift Box with Congratulations Ribbon for the mama to bring home. 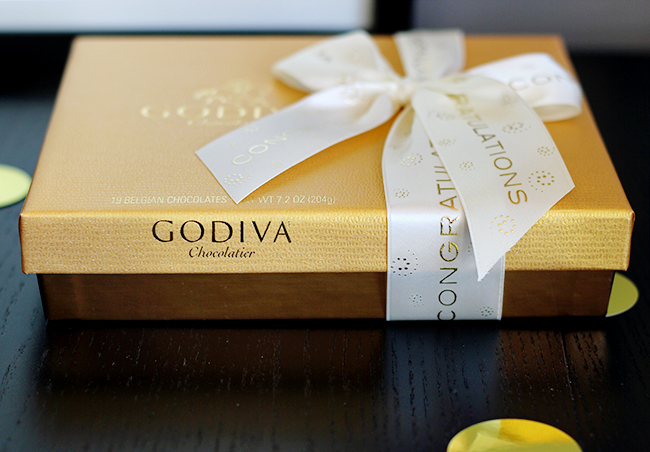 This lovely box of goodness features a signature assortment of 19 different classic GODIVA Belgian chocolates, finished with a white ribbon with "congratulations" in gold. 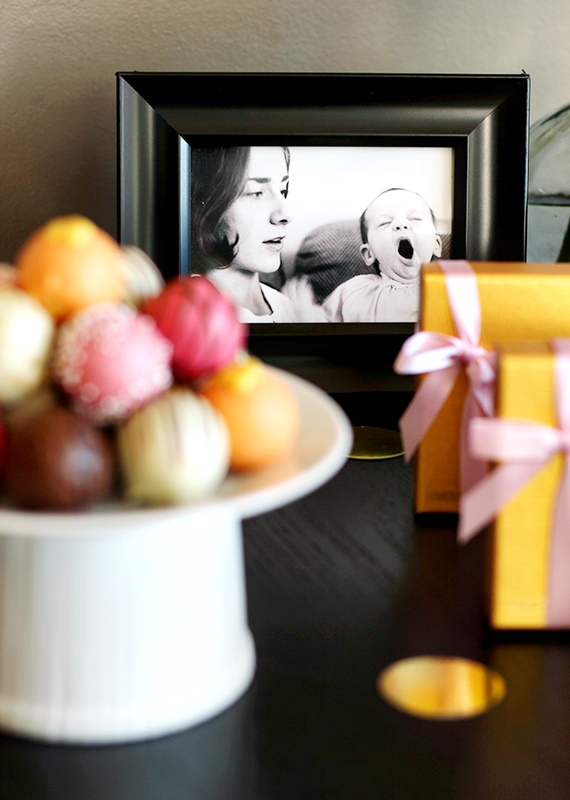 This piece not only made for a special gift, it also helped beautify the table. Double win! 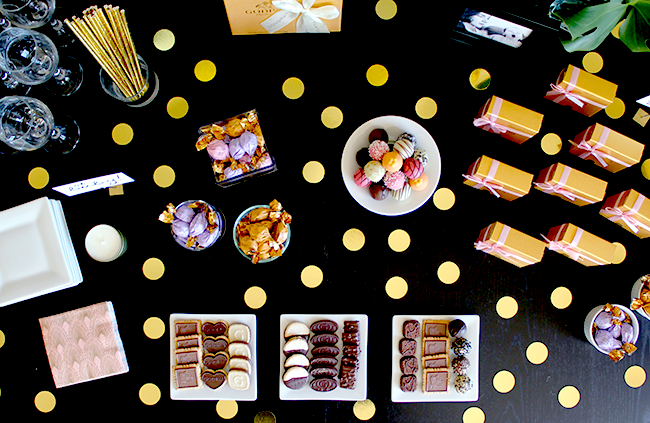 I wanted to add a little color to the black/white/gold scheme and to put together some sort of fancy dessert tray, so I grabbed a GODIVA 24 pc. Ultimate Dessert Truffles Gift Box , which took care of both of these. I arranged these (seriously decadent!) 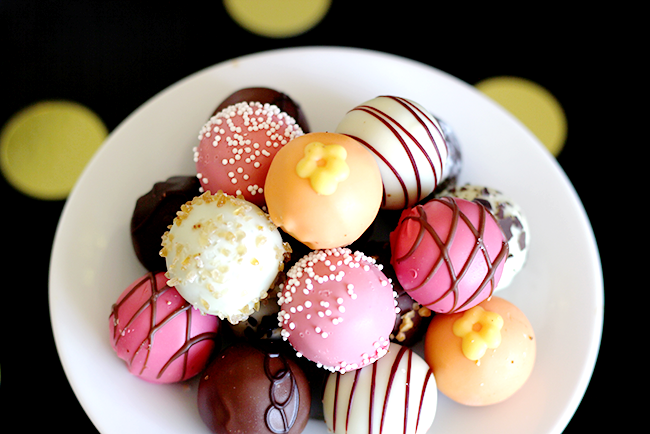 truffles on a white serving stand and they instantly became one of the focal points of the table. The flavors are killer, too - Tiramisu, Red Velvet Cake, Creme Brûlée, Chocolate Soufflé and more - and are all inspired by desserts from fine restaurants and patisseries around the world. To add some more pops of both gold and color, and to offer some wrapped chocolates that guests could also take home, I added a GODIVA Wrapped Dessert Truffles Set of 3 , which included one bag each of Individually Wrapped Crème Brûlée Dessert Truffles, Chocolate Lava Cake Dessert Truffles, and Assorted Dessert Truffles, and arranged them in serving bowls throughout the table. (So good you guys. SO good.) And finally, I displayed assorted biscuits (which happen to be as delicious as they are pretty) from GODIVA's 36 pc. 90th Anniversary Chocolate Biscuit Box, which included Dark Truffle Heart, Chocolate Lune, Petite Mousse, Raspberry Chocolate Premiere, Godiva Signature, and Hazelnut Praline Biscuits (my personal favorite). 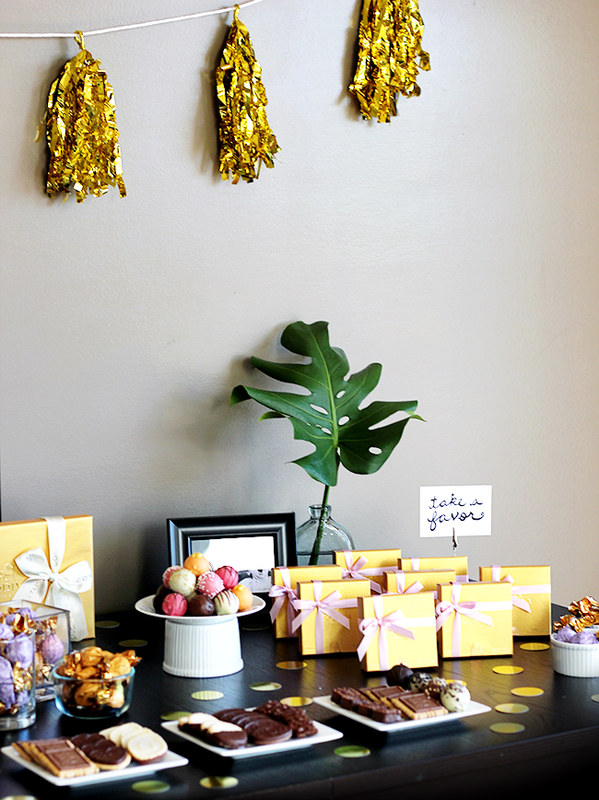 By using these various GODIVA goodies I was able to create a display that featured truly special, personalized edible art - the exact type of tablescape that, in ways that are both practical and visually beautiful, will ensure an unforgettable baby celebration for the guest of honor. 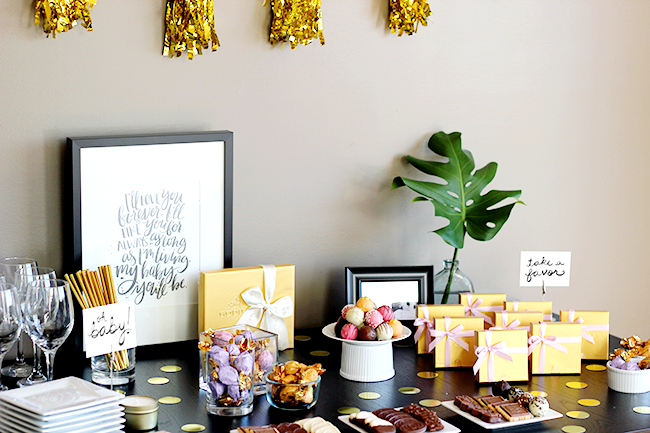 If you're hosting a baby shower (or a wedding shower, or any type of celebration) and want to design a chic tablescape that goes beyond the traditional, I highly recommend incorporating GODIVA chocolates. 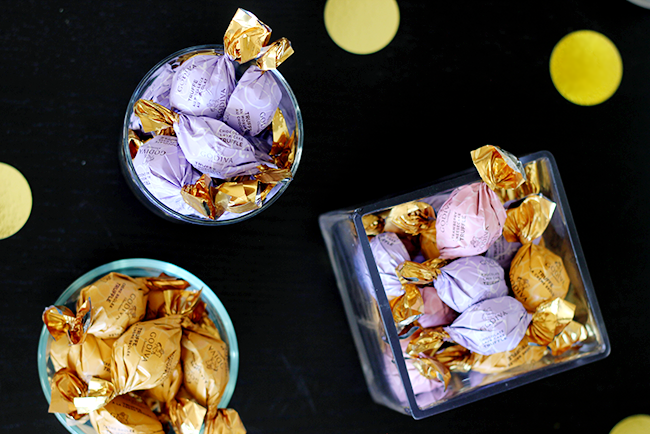 They offer the most beautifully designed and deliciously crafted chocolates, and can even take things a step further with options like personalized ribbons (with almost anything you'd like printed on them, done in just two short weeks!) for their favors and gifts. The options are endless too, with all different price point options, styles, piece counts, and ribbon options. Even beyond parties and life events, I am a lifelong GODIVA fan - I always have at least some GODIVA chocolates in my house to serve guests (and to eat myself!). Here is a great deals for you too (just click on the link to redeem): Save 15% when you $200 Spend on Favors . Woot! What are your favorite ways to design unique baby shower tablescapes? Who else prefers neutrals and golds to tradition shower colors? 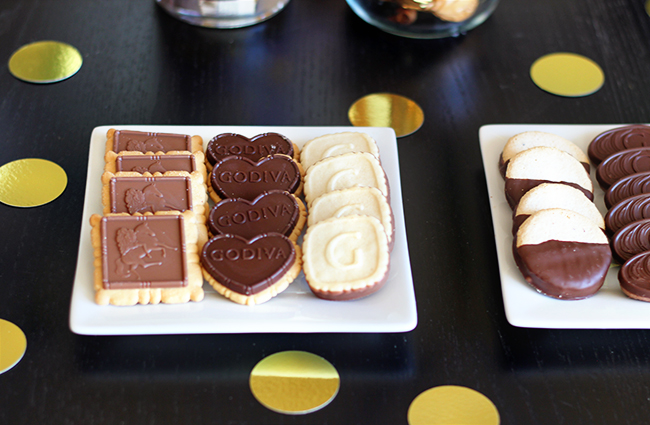 Any other GODIVA fans in the house? Oh my, I'm really trying not to eat refined grains or sugar until vacation next month. This post was too much. Absolutely gorgeous! What an absolutely gorgeous table setting! So inspiring! And now I want to go buy a ton of Godiva haha. Glad to see you posting again too. I know it's got to be hard to focus on work right now. We're continuing to send lots of love.